A few days ago I posted about my move to Folio Literary, and what I’ll be seeking. As I rev up the ol’ query inbox (which is already rumbling with submissions), I figured I’d take a moment to talk a bit about the query letter. How— I mean, for serious, how on earth— does anyone write a query letter? It seems so difficult. Not only are you trying to put your best foot forward and stand out from the dozens— no, HUNDREDS UPON HUNDREDS— of other queriers, you’ve got to summarize your manuscript (impossible), make it sound exciting (huh? ), comp it to other titles (um), talk a bit about yourself (embarrassing), and keep it all under half-a-page (yeah okay no). As if writing the book wasn’t hard enough in the first place. A lot has been written on strategies for great query letters. There are templates and forms online, webinars, talks, and even whole conferences dedicated to the subtle art of the pitch. I myself have gabbed on for hours about this subject without taking a breath. So how best to break down all this information, to actually put it to use? Where, John (you might be heard to ask), does one *start*? …which makes me feel like I’m being pursued by a creditor. Some agents prefer last names, others are less formal. Me, I don’t mind “Dear John,” despite the connotations of heartbreak. But it’s hard to go wrong with a Mr. or Ms. followed by the agent’s surname. Next, I recommend following a little formula. Ready? Don’t panic because it kind of sounds like math. So, X (your main character or protagonist) is Y (in the general place, time, circumstances of the protagonist’s every day life when the novel begins) until Z (the thing that makes the story a story happens). Harry is the main character. At the beginning of the novel he’s a sad British boy (as opposed to an awkward pale girl or rambunctious mouse). That is, until Z: the thing that makes the story a story (and not just a boring portrait of a sad British boy’s life) happens. Reading the above, I already have a sense of the genre, style, and even the market for the manuscript proposed, and the querier has only written a *single line*. Now, the writer has room to go into more detail, offer comp titles, and give a short bio. He or she has hooked me right out of the gate, without preamble. And if this first line sounds good, I’ll be much more interested to read whatever comes next. So, if you find yourself stuck with your query letter, try this formula. If you know any other query tips or techniques, or of useful online resources for query letter templates, etc., please post them in the comments! ← Announcement: I’m Joining Folio Literary! Thank you so much for the great query tip!. Your simple formula inspired me to make a fresh start with my query letter. John, I love math, and this is so crystal clear! Thank you for the examples, too. In the plethora of information out there on querying sometimes the examples are what I yearn for and they are not given. All the best at Folio Jr.! Solid, easy to follow technique for writing your query letter! Thank you so much, I am printing the page and pinning to my wall. Ahh, it’s a simple difference versus my usual formula, but I appreciate how it focuses on character growth. Thank you! This is great. I’ve bookmarked it! It seems so simple. Thanks for this and the color coding. Perhaps I may be able to get a near acceptable version of a non-sucky query. Thank you John! Excellent. Simple and dead on! Thank you, John! Love the simple literary arithmetic. I wanted to share this great article about how to write the foolproof query from literary agent, John Cusick. If you haven’t seen it on his site, you must read this now! He kinda takes the “oof” out of the “fool” for struggling writers. I hope this helps. 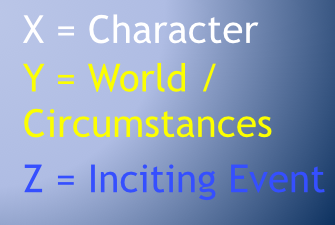 Reminds me of the formula by John Truby: W+A=C (W=hero’s weakness, A=hero’s basic action, C=character change). Thanks for sharing! (X) John is a (Y) cool agent even when he (Z) encounters uncool queries. I recently read a tip to never address the query letter with “Dear”. Simply begin with the agent’s full name. What are your thoughts on this? What was the reason? I don’t see any problem with it, but maybe I’m missing something? I prefer “Dear X,” to just “JOHN CUSICK,” which seems a bit odd. An entertaining agent’s look into the wacky world of querying.